Dust that gets accumulated in our houses is a host to millions of germs and microorganisms. Dusting and cleaning the house in itself is a cumbersome task, what with dust settling on sofas and beds, carpets, curtains and clothes. We all bother so much about insects, mosquitoes, houseflies and do our best to get rid of them. But we often forget about the tiny, almost invisible creatures called dust mites, which are present and booming in millions in the cozy comforts of our homes. 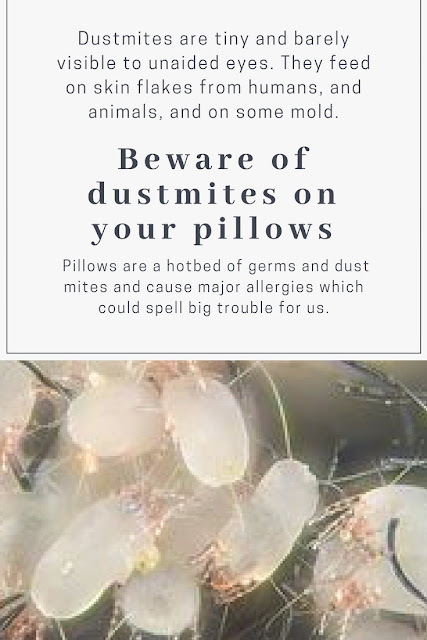 These dust mites often play safe by sneaking into spaces between bedclothes, carpets, stuffed furniture and similar soft objects. The only diet of these dust mites is flakes of skin that the humans shed. And these minute creatures can make us vulnerable to various allergies, even asthma. Getting rid of these troublesome creatures entails a lot of effort. Carpets, floors, beds – all have to be vacuumed and cleaned at regular intervals. Of all the rooms, the bedroom area has to be kept particularly clean. Pillows and quilts are one of the popular places where these devils hide. A recent news item about how our old pillows are a hotbed of germs and dust mites and cause major allergies and which could spell big trouble for us is worth reading. NYU microbiologist Dr. Philip Tierno says as pillows absorb germs from our skin and the air, they become a breeding ground for mold, bacteria and dust mites. And the older your pillows, the more likely they're contaminated. Tierno tested the Bass family pillows and inside the children's' pillows he found fungal mold. Tierno says this is what they're inhaling every time their heads hit the pillow, which cold be playing a role in allergies. On the parents' pillows he found lots of bacteria. Tierno says as pillows absorb germs from our skin and the air, they become a breeding ground for mold, bacteria and dust mites. "It's a literal zoo," he said.And the older your pillows, the more likely they're contaminated. The Bass family hasn't replaced their pillows in eight years. Experts say you should replace your pillows every two years, but that can be costly. Instead, buy pillow protectors that usually cost between $10 and $20. Covers are very effective at preventing contact with mold and bacteria. What's out the pillow can't get into the pillow, what's in the pillow can't get out of the pillow in your face. Congratulations on being included in the NutritionFrenzy.com’s Health and Fitness Forum. I have a similar post called “Top 10 Reasons to Exercise” that can be found at http://marylandpersonaltrainer.com/wordpress/weight-loss/top-10-reasons-to-exercise. Thank you for submitting your post to the Mommy Blog Carnival for April 15th. I've included it in the upcoming edition. :) Hope to see you drop by and check out the other participants. Again, thank you! Great post. Thank you for submitting it to my blog carnival. Wash your pillowcase and face towels on a frequent, regular basis. Dirty towels and pillowcases can house bacteria and germs that can cause blemishes or even worsen existing acne.